From simple cremation to cremation with full traditional services, cremation options at Coastal Funeral Home are available and affordable. Most funeral homes in our area sub-contract cremations to an outside source which may be more than fifty miles away. At Coastal Funeral Home and Cremations, our state of the art crematory is located in the privacy of our funeral home, offering the security that your loved one will never leave our care. 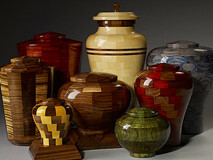 We are uniquely designed so that the integrity of the cremation process is never compromised. Whether you have chosen simple cremation, cremation with a visitation or cremation with a full traditional service, you will have peace of mind knowing that your loved one is in a secure environment and always under our watchful eye. Coastal Funeral Home was the first funeral home in Jackson County to operate a crematory. Having owned and operated our crematory for over 10 years, we have experience in this critical process more so than anyone in our immediate area. Our staff members are continually trained on crematory operating standards, ethics and technology to assure the highest level of professional operation. At Coastal Funeral Home, our promise is and always will be that your loved one will never leave our funeral home or our personal care until they are returned safely to your family. If you have further questions about cremation, please do not hesitate to call on us.